Calculation Views are used to consume other Analytic, Attribute and other Calculation views and base column tables. These are used to perform complex calculations, which are not possible with other type of Views. 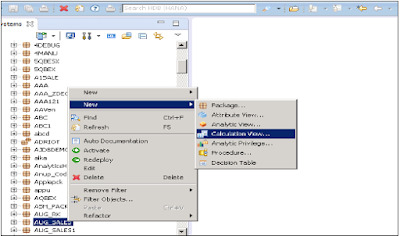 Calculation Views are used to consume Analytic, Attribute and other Calculation Views. They are used to perform complex calculations, which are not possible with other Views. 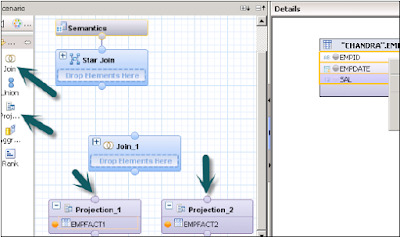 There are two ways to create Calculation Views- SQL Editor or Graphical Editor. Built-in Union, Join, Projection & Aggregation nodes. How to create a Calculation View? Choose the Package name under which you want to create a Calculation View. Right Click on Package → Go to New → Calculation View. When you click on Calculation View, New Window will open. Enter View name, Description and choose view type as Calculation View, Subtype Standard or Time (this is special kind of View which adds time dimension). 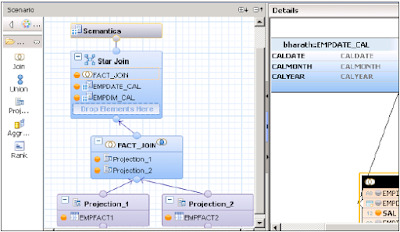 You can use two types of Calculation View − Graphical and SQL Script. It has default nodes like aggregation, Projection, Join and Union. It is used to consume other Attribute, Analytic and other Calculation views. It is written in SQL scripts that are built on SQL commands or HANA defined functions. Cube, in this default node, is Aggregation. You can choose Star join with Cube dimension. Dimension, in this default node is Projection. You have four tables, two Dim tables, and two Fact tables. You have to find list of all employees with their Joining date, Emp Name, empId, Salary and Bonus. Copy and paste the below script in SQL editor and execute. Now we have to implement Calculation View with Star Join. First change both Dim tables to Dimension Calculation View. Create a Calculation View with Star Join. In Graphical pane, add 2 Projections for 2 Fact tables. Add both fact tables to both Projections and add attributes of these Projections to Output pane. Add a join from default node and join both the fact tables. Add parameters of Fact Join to output pane. 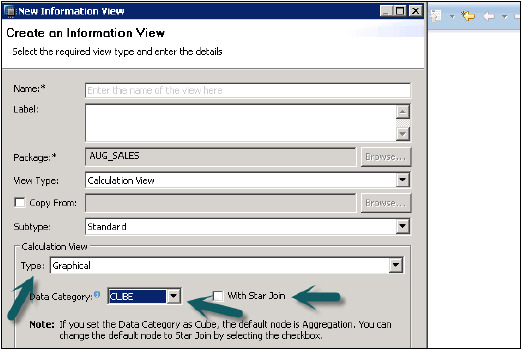 In Star Join, add both- Dimension Calculation views and add Fact Join to Star Join as shown below. Choose parameters in Output pane and active the View. Once view is activated successfully, right click on view name and click on Data Preview. Add attributes and measures to values and labels axis and do the analysis. It simplifies the design process. You need not to create Analytical views and Attribute Views and directly Fact tables can be used as Projections. 3NF is possible with Star Join. Create 2 Attribute Views on 2 Dim tables-Add output and activate both the views. Create 2 Analytical Views on Fact Tables → Add both Attribute views and Fact1/Fact2 at Data Foundation in Analytic view. Now Create a Calculation View → Dimension (Projection). Create Projections of both Analytical Views and Join them. Add attributes of this Join to output pane. Now Join to Projection and add output again. Activate the view successful and go to Data preview for analysis.